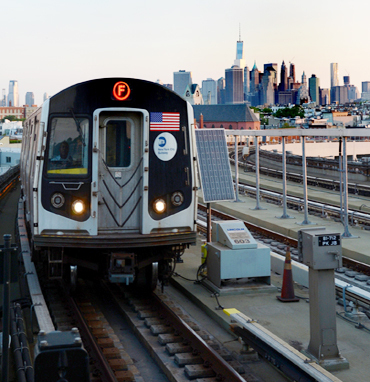 MTA New York City Transit has completed a feasibility study and analysis of implementing an express service on the Culver line in Brooklyn and is looking forward to getting public feedback on it. This study was conducted at the request of riders and elected officials in Brooklyn who use the Culver Line to commute into Downtown Brooklyn and Manhattan. The study analyzes a two-way peak period express service between Church Av and Jay St-MetroTech, with half of the trains operating express during rush hours and half of the trains, along with the trains, operating local. Due to ridership demand falling within NYC Transit's loading guidelines and rolling stock and track capacity constraints, no additional overall service would be added, meaning that should an express be implemented, local stations between Church Av and Jay St-MetroTech would have 50% less peak service. Express riders during the AM peak hour would save on average 3.4 minutes and local riders would lose on average 1.3 minutes, for a net travel time benefit of 27,000 minutes. The maximum northbound travel time savings would be 7.3 minutes. However, more riders would experience longer travel times as ridership is heavier between Church Av and Jay St-MetroTech. An express service could lead to some operational improvements, as southbound express trains would no longer be delayed by terminating trains discharging at Church Av and by trains originating at Church Av. express trains would be slightly more crowded than current trains, although still within NYC Transit's loading guidelines, while the locals would be less crowded. There would also be increased stair crowding at a couple of local stations due to larger PM exit surges per train. The report preliminarily recommends that due to the overall net passenger travel time savings and potential operational benefits, an express service should be implemented after the end of the Culver station project in early Fall 2017. While there are admittedly disbenefits to local riders who would face longer wait times, those riders with access to express service would see reduced travel times, and this would be a net improvement in service. MTA New York City Transit is looking forward to starting the public dialogue on this issue. If you have comments on the study, please submit them here.